I finally found out that he indeed uses a Pro Preferred. I culdn't tell whether it was a Heart of the Hide or a Pro Preferred. I love Lince's glove. I like the way he has his embroidery. He has his name on his index finger. I'm thinking about getting that on my next Rawlings Pro Issue. And maybe getting the R patch on the back of the hand. 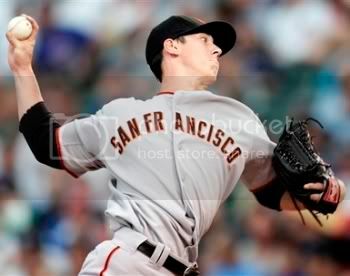 Is anyone else a fan of Lincecum's glove? wonder what size it is? I would guess a 12 1/4. Because a lot of pitcher use PRO1000'S nowadays. I'm not sure so don't quote me on that one. It was just a guess. Pretty sure it's a PRO-991xxx, which is 11.75 inches. Thanks for the info, Kyle. Where did you find this out? There have been a bunch of Lincecum gamer's on ebay recently. Look around. They are not hard to find. Thanks. I'll look I hven't seen one. Although I do like his regular gamer, This one is even better! Look at picture number 3. Reminds me of the one Zito uses. Like? I believe that one was also featured in the SI article w/ Matt Cain (mesh back fingerhood over middle finger). 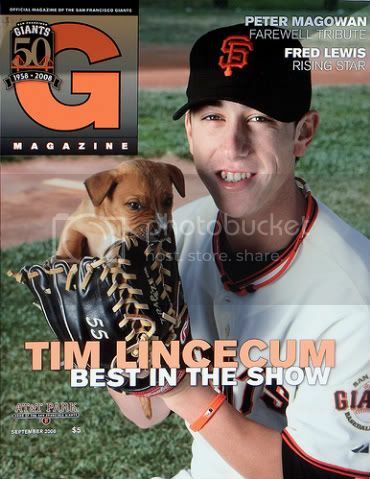 Lincecum is a glove nut who will rotate gloves from start-to-start. I've also seen him use a modified trap & trapeze. This guy is rapidly becoming one of my favorite players. Do you have pics of him using Trapeze's or Mod Trap's? 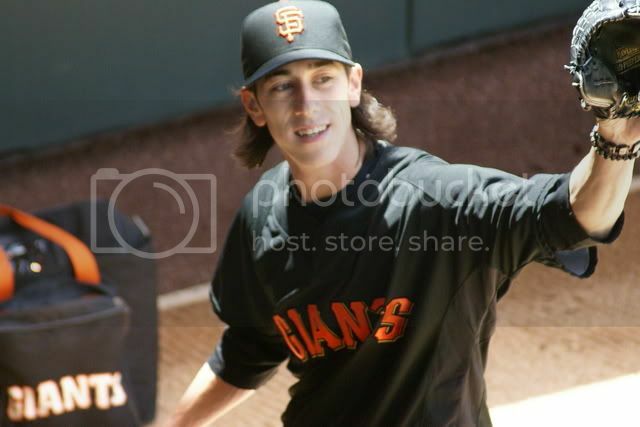 Post subject: Tim Lincecum: glove-a-holic? Obviously not a game photo but at least you can see the glove. Although I've never personally seen him use the trap in a game I swear I've seen a game photo of it somewhere. I've definitely seen him break it out pre-game on non-start days. There was an article describing him checking out and smelling one of Rich Aurilia's new gloves. The quote was something like "other guys are into bats and cleats but I like gloves"
I heard he was leaving Rawlings for a contract with N.O.R.M.L. Anyways, that Trap is SICK! !